Dual Diagnosis recovery blends the most successful aspects of mental health care and substance abuse treatment. Instead of drawing a hard line between psychiatric health and addiction, at Dedicato Treatment Center these areas are treated as part of a continuum. At Dedicato Treatment Center our team of licensed and certified mental health and addictions professionals will help you deal with both your addiction and any co-occurring mental health disorder you may be dealing with. 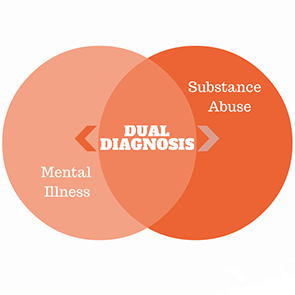 Dual Diagnosis recovery blends the most successful aspects of mental health care and substance abuse treatment. To receive a Dual Diagnosis, you must meet the criteria for a mental health disorder as defined by the current version of The Diagnostic and Statistical Manual of Mental Disorders. Published by the American Psychiatric Association, the DSM-5 is the guideline our mental health professionals use to make the appropriate diagnosis. To assure accuracy and effectiveness in “diagnosing” our clinical team of licensed and certified mental health clinicians and addictions professionals meet weekly to discuss and conceptualize each patient case, so we can collaborate and develop a treatment plan with our patient’s.